I love Cheetah’s, I think they are amazingly graceful, elegant and delicate big cats, it’s been a while since I saw one in the wild but I will never forget seeing them for the first time. There is something mesmerizing about their eyes and expression. I came across this traditional Zulu story about how the Cheetah got their tear stains, which I think is wonderful in how it delivers it’s message. “Long ago a wicked and lazy hunter was sitting under a tree. He was thinking that it was too hot to be bothered with the arduous task of stalking prey through the bushes. Below him in the clearing on the grassy veld there were fat springbok grazing. But this hunter couldn’t be bothered, so lazy was he! He gazed at the herd, wishing that he could have the meat without the work, when suddenly he noticed a movement off to the left of the buck. It was a female cheetah seeking food. Keeping downwind of the herd, she moved closer and closer to them. She singled out a springbok who had foolishly wandered away from the rest. Suddenly she gathered her long legs under her and sprang forward. With great speed she came upon the springbok and brought it down. Startled, the rest of the herd raced away as the cheetah quickly killed her prey. The hunter watched as the cheetah dragged her prize to some shade on the edge of the clearing. There three beautiful cheetah cubs were waiting there for her. The lazy hunter was filled with envy for the cubs and wished that he could have such a good hunter provide for him. Imagine dining on delicious meat every day without having to do the actual hunting! Then he had a wicked idea. He decided that he would steal one of the cheetah cubs and train it to hunt for him. He decided to wait until the mother cheetah went to the waterhole late in the afternoon to make his move. He smiled to himself. When the sun began to set, the cheetah left her cubs concealed in a bush and set off to the waterhole. Quickly the hunter grabbed his spear and trotted down to the bushes where the cubs were hidden. There he found the three cubs, still to young to be frightened of him or to run away. He first chose one, then decided upon another, and then changed his mind again. Finally he stole them all, thinking to himself that three cheetahs would undoubtedly be better than one. When their mother returned half-an-hour later and found her babies gone, she was broken-hearted. The poor mother cheetah cried and cried until her tears made dark stains down her cheeks. She wept all night and into the next day. She cried so loudly that she was heard by an old man who came to see what the noise was all about. Now this old man was wise and knew the ways of the animals. When he discovered what the wicked hunter had done, he became very angry. The lazy hunter was not only a thief, he had broken the traditions of the tribe. Everyone knew that a hunter must use only his own strength and skill. Any other way of hunting was surely a dishonor. 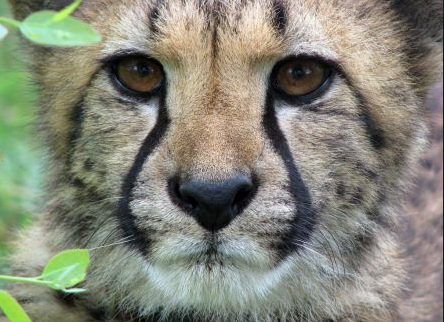 This entry was posted in Cheetahs and tagged Africa, Big cats, conservation, fables, How the Cheetah got it's tear stains, stories, wildlife by Purr and Roar. Bookmark the permalink.